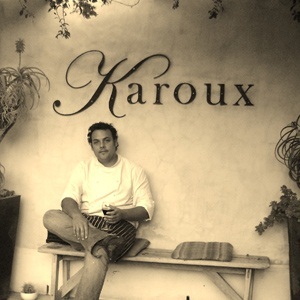 Wine Editor, Cathy Marston loves the local vibe at Karoux. I just love this name! The current owners have been here for about 8 months, so technically this is the ‘New Karoux’ which sounds like a coyote going fox-hunting, but is actually particularly apt for Chef Ryan Josten and wife Aimee, since both of them spent time working with Albert Roux in Scotland not so long ago (Karoux – Roux – geddit??). The restaurant is on the main street of that foodie-Mecca-beyond-the-mountains which is McGregor, and even in the short space of space since the Jostens took over, they appear to have established a reputation amongst the locals as the place to be. It’s situated off a courtyard containing a fish-and-frog-filled pond and is filled with quirky memorabilia, without any of the grubbiness and chaos some shabby-chic restaurants seem unable to avoid. It’s a small restaurant – I counted around 30 covers – and you would do well to book. We dined at 6pm because our son was with us and by 6.15pm, there were already another 2 tables dining alongside us and by the time we left before 8pm, the place was almost full. Ryan and Aimee spent some time in Scotland, not just with Albert Roux, but also with renowned chef, Tom Lewis at Monachyle Mhor Hotel. Back from the chilly North, Aimee managed Catharina’s in Steenberg, whilst Ryan settled in as Head Chef at The Conservatory at The Cellars-Hohenort. His food is absolutely and completely my style of dining – ample portions of classic-combos, beautifully-prepared in a modern fashion and mouth-wateringly appealing to the eye. We ate pretty cubes of Crispy Pork Belly with slices of black pudding on a spring pea-puree which was delicious, plus Ryan’s signature starter of Twice-baked Gruyere Souffle served with Tanagra grappa - the only reason we didn’t wipe up the last smears with our fingers was because other guests had arrived by that time and we stupidly let convention dictate otherwise. Mains were Yellowtail, fetched fresh from Struisbaai by Ryan and Aimee themselves and a thunderingly-good Lamb and Waterblommetjie Pie. Is there anything to beat a really great pie when it comes to making your tummy happy? Nope, thought not. My only caveat with the food is never believe Aimee when she tells you the dessert portions are small. My Caramel Meringues with Bananas and Butterscotch would have fed a family of 4, but it was so delicious that I am ashamed to say I scoffed half of it before I realised that even my elasticated-waist trousers had admitted defeat with a ping. Is all proudly-local and reasonably-priced. Lourens van der Westhuizen appears to have cornered the market in the Robertson’s boutique wine-producing market and tasting his Arendsig Shiraz, it is easy to see why so many small guest-houses, restaurants and wine farms have chosen him to make their wines for them. This is the once-a-week, every-week local that everyone wishes they had on their doorstep. If you want special occasion it will work too, but the prices and the relaxed atmosphere mean that I’d try and find as many special occasions as I could if I lived in McGregor. They were charmingly-accommodating with my son in a gentle, no-fuss fashion which is so essential to any parents dining out, the food was brilliant and deeply-satisfying, it’s great to see a chef who’s happy to come out of the kitchen – carrying plates to tables no less, whilst Aimee greeted new customers – and I can’t think of many evenings I’ve enjoyed more. Go. You’ll love it.